Sometimes -- no, OFTEN -- I back myself into a corner. Such is the situation with my current project. I received a roll of strips in colorful modern fabrics from my Secret Sister last year. I pulled them out as potential contenders when working on the triangle log cabin projects last month, but they weren't quite right. Determined not to bundle them back into a drawer or, worse, just shove them aside on my table, I used the majority of them for the 4-patches in Candy Dish, but there were a few on the light side that didn't play well in the dish. So I paired those with the solids from another roll (oops, now another partial roll to deal with!) and made more 4-patches. My plan was to put them on point in a strippy setting -- using nothing but fabrics I have on hand. First issue was finding a fabric for the setting triangles. After totally littering every surface in the sewing room, I settled on a lively yellow. But, as you can see, it blends into the yellow solid. Then, more trouble trying to find a suitable fabric for the separating strippy strips. Time to change horses or pick another stream! What if I omit the separating strip fabric and just put my 4-patch strips together? Let's see, I had forty 4-patches. Instead of four strips of 10 separated by another fabric, how about five strips of 8? A perfect crib size with perfectly soft colors! So that's what's on my design wall this morning. Hop over to Patchwork Times to see what others are working on. Several bloggers I follow are bird watchers, as am I. Just wondering .... do you feel that the appearance of an unusual bird is a special blessing? From the kitchen window one day last week, I caught sight of a bright red blur among the trees. We have tons of cardinals, but what caught my attention was the intensity of the red color. Then I saw distinctive black wings. I can't take credit for the photo. He was too far away to photograph. 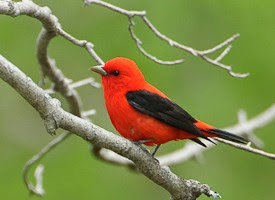 But there is no doubt I was looking at a scarlet tanager! A first for me. I see from my field guide that we live at the southern limits of their summer breeding ground. And I also realize, after looking at the pictures in the guide, that I may have seen some at the feeder which I misidentified as gold finches because the males lose their color after the summer breeding season and the females are always yellow-green. Now that I know what to look for, I may see more! Linking up with Free Motion on the River. After a week or more of hazy, hot, and humid days, tonight we are able to open the windows and appreciate the breeze! Between loads of laundry today I managed to spend a bit of time in the sewing room. I'm happy to report that the rows of Candy Dish are finished!! I just need to put them all together into a top. However, I needed the design wall for something else so Candy dish has gone into a phalata bag (that's a bag for later .... it's a long story!). Needless to say, I can't count it out for June's stash status. However I can count 9 Christmas table runners (3.75 yards) and their backs (4.5 yards)! Here in the South weather forecasters only have to say "triple H" and we know it's going to be a hazy, hot, and humid day. And that's my cue to stay inside and sew. Okay, I'll admit, it doesn't take much to encourage me to stay inside and sew! I had so hoped I could report that Candy Dish is finished. See those two holes in the last row? As I got close to the end, the variety of fabrics in my already-made half-square triangles diminished. I'd make a few more HSTs, put the foursies together, and I swear there were just as many holes to be filled as when the day started! Do you ever have days like that? Where you feel like you're sewing upstream? Once I fill those two holes, all that will remain is putting the rows together. That may have to wait till the August retreat -- we'll see. Assembly will take place at the S'mores retreat where I'll have a lot of flat space to make the sandwich. The directions call for a knife edge finish, but I have difficulty getting a good edge when I turn inside out so I'm considering a traditional binding. Tune in next month to see how it goes. Being as it's Friday, I'll hook up with Sarah at Confessions of a Fabric Addict. Candy Dish is half done. I am currently working on the upper half (turned sideways in the photo). Almost all the units are made. I need to make a few more HST units, and maybe a few of the 4-patch units. I may have over-estimated! But I have a plan for the remaining units, including the remainder of the roll of strips. "Ginger Belle" from Miss Rosie's Spice of Life is my inspiration. I will be using 4-inch units instead of 3-inch as in the pattern. I drew a box around the two blocks to help me see how it will go together. A cream Moda Marble Dot will be the background. Limiting myself to leftover strips, supplemented by another roll of solid strips on hand, dictates that it will just be a 3x3 setting which will give me a 68" square quilt -- a good size for cuddling under. "The Trouble with Tribbles" was probably my favorite episode of Star Trek. As I recall, the Tribbles, furry little creatures, kept reproducing/multiplying, much to the chagrin of the Enterprise crew. That's the way I feel about strings -- they multiply when you're not looking! In an attempt to clean the cream/neutral strings off my side table, I decided to devote my time Sunday to making more 6-1/2" string blocks. Here's the scenario (and it all boils down to my decision to make 6-1/2" blocks): It takes a strip about 10" to cover the diagonal, and another strip almost as long to go on either side of it. Most of my scraps are a LOT smaller, so I dug into my 1-1/2" strips. Likewise, the corners are best done with triangles, so I dug into my squares. Before I knew it, my pile of cream/neutral scraps was bigger than when I started -- and I made 21 blocks yesterday!! Currently in progress -- "Candy Dish," (my variation on "Beach Party") and Twist of Lime. As soon as I get these two projects out of the way -- or to a point where I need to take them to a retreat -- I plan to sew stripsets with all the 1-1/2" strips I cut for the log cabin project that I didn't use. I've been looking through my books for projects that will use 4-patches, 9-patches, 16-patches -- anything that starts with a 1-1/2" strip. Suggestions, Anyone? Happy to report the deer have not found the still-to-be-planted butterfly bushes at all tempting and the recently planted azalea is flourishing. Stash Status last week: nothing in, nothing out. I'm close to finishing the Christmas table runners. Six tops are finished and three more are cut and ready to stitch. Then it will be on to final assembly. Because it's Monday, I'm linking up with Judy at Patchwork Times. Ever the optimist, I have put out some new plants close to the route the deer take down to the river across the street. And, as typical, I've decided to do this in a drought period ... which means daily watering. I moved on down the driveway a bit to hose down the impatiens in the big pot. As I turned to go back up the hill I saw a big, beautiful doe staring at me from the area I had just been watering! Where did she come from? How come I never heard her coming? In my surprise I turned toward her with hose in hand and she scampered away. The pattern is a variation of "Beach Party" from More Nickel Quilts. When I look at it from across the studio the colors remind me of Skittles in a bowl so I'm going to call it "Candy Dish." My design wall is too narrow to hold it all so I'm now working on one side at a time. It's Friday, so I'm hooking up with Sarah at Confessions of a Fabric Addict. The next round of 4-patches will feature blue. Over a week ago, when I should have been sewing triangle log cabins, I was working on Twist of Lime. It still rests in a pile. So what's on my design wall? These colorful strips were piled on my sewing table after I rejected them for the log cabin project. Rather than just put them away, I decided to pair them with a set of white-on-white strips I purchased this week to make 4-patches. Take a look at other design walls at Patchwork Times. Then, on the trip home from Illinois Monday 22.5 yards jumped into my basket at Hancocks of Paducah -- mostly Christmas fabrics for gifts I have already started. During my quick stop at Hancock's of Paducah Monday I picked up a Christmas border stripe to make table runners for the "A-Team" of gals who care for my mother-in-law (a/k/a The Queen Mother). It didn't occur to me that there would be 4 stripes across the width of the fabric and since there are 4 "regulars" who make up the A-Team, I purchased 4+ yards! DUH! I'm using the Triangle Frenzy Swirl pattern by Bunnie Cleland. Once the cutting is done, the top goes together very quickly -- did these two in about an hour this morning. The completion stage will follow when I get all the tops completed. Linking up with Sara at Confessions of a Fabric Addict. One of the pieces I picked up at Hancocks of Paducah was a Christmas border stripe. I couldn't wait to cut into it! It's perfect for Bunnie Cleland's "Triangle Frenzy Swirl." I've seen several versions of this and have been looking for an opportunity to try it myself. Very quick and easy. I plan to make one of these for each of the Queen Mother's caregivers. Sunday's class was at Susan's Calico Creations in Fulton, IL. We were working on two other patterns from Not Your Grandmother's Log Cabin by Sara Nephew and Marci Baker -- "Fireworks" and "Winter Snow." Both of these patterns use only triangle log cabin blocks, which made the cutting easier than Saturday's class. The quilt is assembled in rows like other hexagon quilts. The table topper is assembled in wedges like the Japanese Star. We had a great class with some very accomplished quilters. Take a look at their progress. These last few were working on Winter Snow. Shop owner Susan May (a/k/a Sister Mary Susan) was a gracious hostess. Her classroom is outfitted with lots of tables and design walls. And she's open on Sunday! If you're ever in northwestern Illinois, it's worth a trip over to Fulton to visit Susan's Calico Creations. The trip back from Fulton, Illinois yesterday went well until I reached I-57. For the next two hours I was driving through torrential rains, the kind where you can barely see the white line on the edge of the interstate or the rear lights of the car ahead. It was a tense time, but I puddled on. Needing a break, I decided to reward my perseverance with a stop at Hancock's of Paducah! All I needed was a Christmas panel that wasn't too cute or too over-the-top-Christmas for my SIL's mountain cabin. This is what I settled on. It came with a nice pattern for a pieced border to dress it up. I think it reflects the natural area and is "neutral" enough that she can hang it for the entire winter season. But could I leave with just that? Of course not! There were the coordinating fabrics, other panels for Christmas pillows, a Christmas stripe for table runners, and a delicious Kaufman "Beau Monde" piece that jumped into my basket. There is a plan for everything -- lots of gifts to be made. I can hardly wait to get started! The consequences of this one-hour layover was another rainstorm from the Tennessee border till I got home. In reality, I missed most of the worst rains in the areas I drove through, so I feel blessed. Yesterday's class at the Covered Bridge Quilters Guild was a success ... so I was told ... it went by in a blur of activity. But I have photos to prove that progress was made. The class project was "Japanese Star" designed by Marci Baker. Here is an old photo of mine. Eleven hearty quilters went outside their comfort zones to learn how to make log cabin blocks in new shapes. The more difficult is the diamond; everyone completed at least one, some more, and they were all beautiful. Since I haven't learned how to make a slide show, I'll just post a few. The challenge with the diamond is that half the logs "lean" to the right, and half "lean" to the left. So our mantra for the morning was "Come RIGHT in; don't be LEFT out" to help us remember how to orient the Clearview Triangle when cutting. Those who chose to work with batiks learned that miscuts could just be turned over to correct the mistake. They also learned that this reversibility increased the chance they might stitch it on the wrong side! In the afternoon we worked on the easier triangle blocks which are added to a diamond to form one of six wedges. I received a text late last night with a photo of this last one complete! Thank you, Covered Bridge Quilters, for your hospitality. You were a brave bunch and I have confidence your projects will be ready for next month's show'n'tell! I was so whipped after the long drive yesterday that I couldn't remember the name of the shop here in Princeton, IL. Stopped back by this morning and picked up a few gray fat quarters to go into Twist of Lime. Read on the guild's Facebook page that today is a sew day so I took a chance and stopped by the church to see if I could unload my stuff for tonight and tomorrow. I didn't want to have to unload in my new white pants (talk about a fashion mistake!) With luck, several of the girls were there and they made me feel welcome and more relaxed. Since it's the Covered Bridge Quilters Guild, I felt required to go check out their namesake. It says, "Five dollars fine for driving more than 12 horses, mules, or cattle at one time or for leading any beast faster than a walk on or across this bridge." I drove over it with no problem. Resting at the hotel and doing a bit of last-minute rehearsal for the next two day's classes. Nothing beats the company of Stephanie Plum on a solo 500-mile drive! Today's adventure was #19 in the series (not including those "between the numbers") by Janet Evanovich: Notorious Nineteen. Evanovich certainly has a way with words and can spin a hilarious mystery yarn. Robert Parker is in line for my trip home, along with a new author (for me) Galbraith. Safely ensconced in Princeton, IL. When I was scoping out the location for tomorrow night's lecture, I passed a small quilt shop in town. They were kind enough to let me use their cutting table to trim the Exploding Pineapple which I picked up from my longarmer yesterday. Nice little shop; I look forward to spending more time there tomorrow. There's not much new to report from here on the hill. I only had one taker on my offer to share my leftover braid trapezoids, so these were shipped to Nann of With Strings Attached on Friday. I didn't take time to count them all so I'm estimating 2 yards total went out of my stash. The classes I am teaching next weekend in Princeton and Fulton, Illinois are both from the book Not Your Grandmother's Log Cabin by Sara Nephew and Marci Baker. After scheduling these classes, I was chagrined to learn that the book is out of print (and listed on Amazon for astounding prices!). NOTE: Like several other authors recently, Marci is changing to C&T publishing. There are plans to issue a revised edition of this very popular book later in 2015. Marci has graciously granted permission for me to teach these two classes from copies. The "Japanese Star" table topper has been developed as a standalone pattern, so I spent a good portion of last week working myself through the pattern to make sure there are no significant changes from the one I used to make my original star table topper. I used strips I had cut several years ago for this and it has been going together smoothly except I don't think the color variation of the purple hand-dyed fabrics is quite as dramatic as the orange and rust. I experimented with the orientation of the diamonds in the star. The difference is dramatic. I will leave the star unfinished so that I can demonstrate the effect of color/value placement. Standing at the ready is a stack of Grey squares for "Twist of Lime." I try to sneak a few of these into the lineup every day. I just have to make sure I have the needle centered, as I am using a line on my machine bed to guide the stitch'n'flip corners instead of drawing on the fabric. ... the trimmings from the stitch'n'flip corners making half-square triangles. Happy June to everyone! Summer's unofficial beginning.